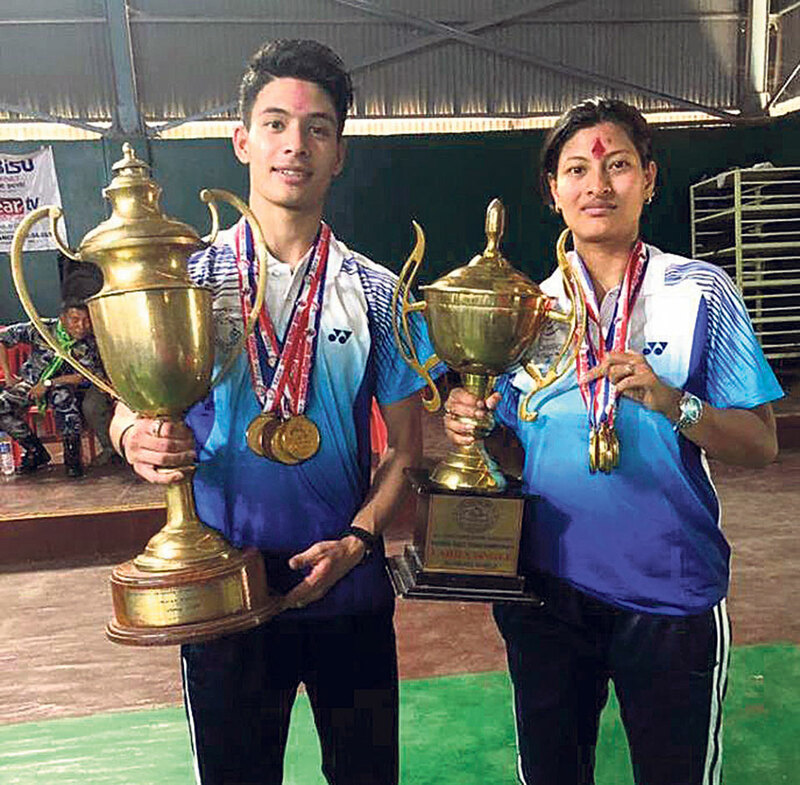 KATHMANDU, April 14: The departmental team Nepal Police Club’s defending champion duo Santoo Shrestha and Nabita Shrestha won gold medals in the 40th Table Tennis Tournament under the ongoing Eighth National Games in Dang on Saturday. Santoo won the title in men’s singles category and Nabita claimed the women’s singles in the final matches played at the Ghorahi Covered Hall. Earlier on Thursday, they had claimed the mixed doubles. They had also won the singles title in the last edition of the National Games. In the men’s singles final, Santoo defeated his own club’s Pradeep Roka on straight sets 11-1, 11-5, 11-6, 11-5. Earlier in the semifinals, Santoo beat the other departmental team Armed Police Force (APF) Club’s Shiv Sundar Gothe 4-2. In the women’s singles final, Nabita beat Police’s Alina Maharjan 11-7, 11-5, 7-11, 11-9, 9-11, 12-10 to win the gold. Nabita had defeated Dikshya Tamang 4-0 and Alina saw off Rabina Maharjan 4-2 in the semis to advance into the final. The pair of APF siblings Ivan Lisano and Ashlesha Lisano have won the mixed doubles in the 15th National Lawn Tennis under the Eighth National Games. In the final, the pair beat Abhilasha Bista and Pranab Khanal 3-6, 6-4, 10-7. 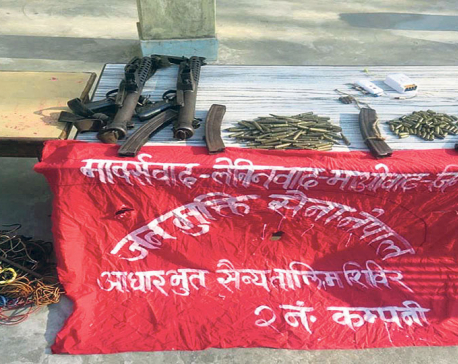 Province 4’s Anil Shahi and Ganga Sharma along with the other departmental team Tribhuvan Army Club’s Abhinav Acharya and Ira Rawat became third. In men’s doubles, Province 4’s Pradeep Khadka and Nabin Magar overcame Dharma Lamichhane and Shahi 6-3, 6-3 of the same province while Lisano and Jitendra Pariyar saw off APF’s Chhewang Lama and Santosh Khatri 6-2, 6-2 to enter the final. In women’s doubles, APF’s Saloni Tamang and Lisano beat Bista and Rawat 6-4, 6-1, while APF’s Prerana Koirala and Anne Mathema defeated Province 4’s Shreya Bhattarai and Romika Buddhacharya 6-0, 6-0 to enter the final. Gandaki Province’s Amrit Thapa Magar has become the champion of the men’s singles in the 11th National Squash in the games. At Satdobato, Lalitpur, Magar beat Province 3’s Prabeen Bir Singh Kansakar 11-5, 3-11, 11-7, 11-4. In women’s singles round robin, Province 3’s Bhawana Sunuwar has registered her fourth straight win. She defeated her province’s Bipana Blon 11-7, 13-11, 12-10. Sunuwar has only one game left among the six participating players. In the other matches of the category, Gandaki’s Krishna Thapa beat Province 3’s Swasthani Shrestha 11-7, 11-9, 11-5, while Province 3’s Manjila Magar saw off Gandaki’s Salini Ghimire 11-3, 11-2, 11-3. The departmental teams Army and APF have dominated in the triathlon winning all events in Pokhara. Army’s Dipesh Chaudhary, clocking one hour, eight minutes and 88 seconds, won the gold medal in 750 meter swimming, 20 km cycling and 5 km race. In the category, Army’s Basanta Tharu, clocking one hour, nine minutes and nine seconds, won silver, while APF’s Nitesh Manandhar, clocking one hour, 15 minutes and nine seconds, finished on bronze. In women’s triathlon, APF’s Sony Gurung, clocking one hour, 22 minutes, won the gold, while Army’s Keshari Thapa Magar, clocking one hour, 29 minutes and 30 seconds, got silver, while Gandaki’s Jamuna Thapa finished on bronze clocking two hours and 30 seconds. In duathlon of men’s category, APF’s Laxman Malla, clocking one hour, one minute and 15 seconds, won the gold, while APF’s Humi Budha Magar, clocking one hour, 16 minutes and 17 seconds, got her hands on the gold in women’s category.